Podcasts are one of my favorite things. Back in early 2015 I got really into them and I haven’t slowed down! 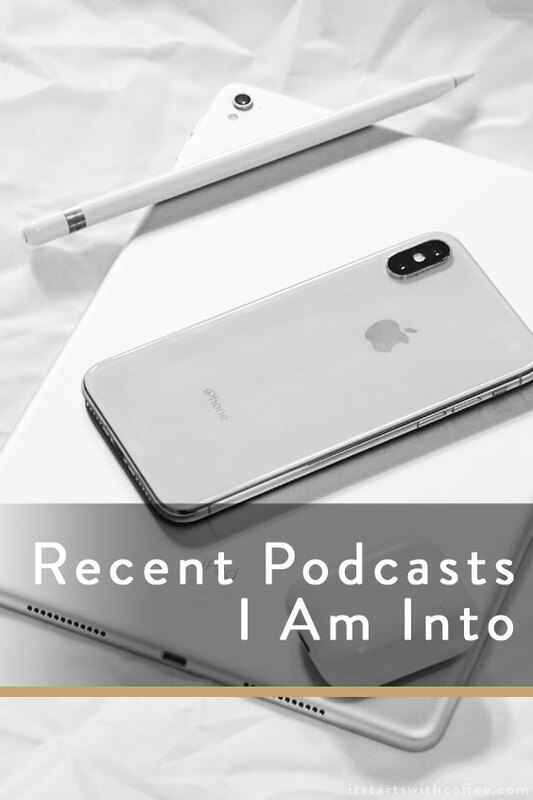 I have shared my favorite podcasts, podcasts for moms, personal growth podcasts, guilty pleasure podcasts, blogging podcasts, true crime podcasts, health and wellness podcasts, random favorite podcasts, healthy living podcasts and inspirational podcasts. I wanted to share the recent podcasts I am into. Some of them are brand new and some just new to me! Bad On Paper: This is one I have mentioned before but I am mentioning again because they just started back after a short break. They have had some super amazing guests and I always love hearing Grace and Becca’s obsessions. Long Story Short: This is a podcast by Bobbi Brown and she interviews other successful people about how they got started and what they do to keep it up! So fun! Cold: If you followed the Josh Powell case years ago about the man in Utah who’s wife went missing and then he essentially blew his house up with his two sons inside. Well this is going REAL deep into their past, the relationship, and what happened. It’s really interesting. Hashtag No Filter: Great podcast with interviews from influencers about their jobs and their lives and just so much more! Rise: If you haven’t jumped on the Rachel Hollis, Girl Wash Your Face bandwagon then you may be the only person. But her podcast is fantastic and is such a great extension of the book that will keep you crazy motivated and inspired. U Up: HYSTERICAL podcast about dating in modern times. As someone who met their husband before the swipe right and left times I find myself cracking up when I listed to some of these stories. Him and Her: Great podcast by The Skinny Confidential. They have interviewed successful influencer couples, and just successful people in general. They also talk about their own life and are both so fun to listen to. What podcasts are you into right now? Long Story Short is going on my subscription list! These are so fun! I love View from the Porch too. I’ve got to listen to Cold. Sounds so interesting, I watched a documentary about him a few months ago. Gotta say I’ve happily jumped off the Hollis bandwagon. I kind of want the time I spent reading that book back. I think I would find U Up funny for the same reason. I met my husband over 10 years ago, so before online dating was really a common thing. I love liesting to podcasts when Im working or editing images! I let my mind wonder. My faves are from BBC radio and FashionPotluck! Give it a listen! Cold totally sounds like something I would listen too! There’s a few podcasts I’ve been wanting to dive into but they are mostly fitness related! I have never really gotten into listening to podcasts – but I definitely should. These are some really great recommends. I love listening to podcasts. It is the most productive way I can spend while on the road. Would love to check the podcasts you’re into. I am most interested by Bobbi Brown’s podcast. Thank you for sharing your recommendations. Thanks for your recommendations! I am always looking for new podcasts to read! I needed some new podcasts to listen to! I usually listen when I’m in the car or at the gym. I love The American Life and Serial. I’ve never listened to a podcast. I’ve been thinking about giving it a shot. I’m more of a reader but thank you for recommending some good ones. I’ll give some of these a try. I have never listened to a podcast but am interested in starting. Thank you for the suggestions! Definitely taking note of these! Thank you! Wow! That was totally awesome! I am really glad to read all about these. Thanks for sharing! I applaud your effort as I just can’t find the extra hours to listen to anymore that I already do. I might check out one or two off your lists. Yes, we love a good podcast! All over the place with what we listen to, haha. My current favourite podcasts are The Hurricane Tapes & Criminal. I will definitely check out Cold. I am not much into poadcasts but would love to, so yout suggestions are very welcome! I’ve been looking for some new podcasts to listen to. I haven’t heard of any of these so I’m excited to check them out.